A product of the ‘great rivers delta plan’ of 1995, this dam is to regulate the high water between the inland seas of Ketelmeer and Zwartemeer during heavy storms. It is in effect a gigantic set of rubber bellows that can be inflated to attain a height of eight metres. The only parts visible at normal water level are the two pump control rooms flanking the dam. 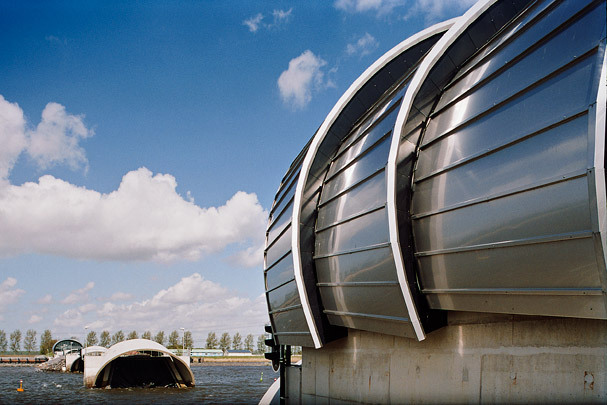 The roofs, constructed of six ellipsoidal trusses with stainless steel panels, echo the shape of the dam. All 230 panels are differently shaped.